Here is a table showing the annualized change in Headline and Core CPI, not seasonally adjusted, for each of the past six months. Also included are the eight components of Headline CPI and a separate entry for Energy, which is a collection of sub-indexes in Housing and Transportation. We can make some inferences about how inflation is impacting our personal expenses depending on our relative exposure to the individual components. Some of us have higher transportation costs, others medical costs, etc. Here is the same table with month-over-month numbers (not seasonally adjusted). 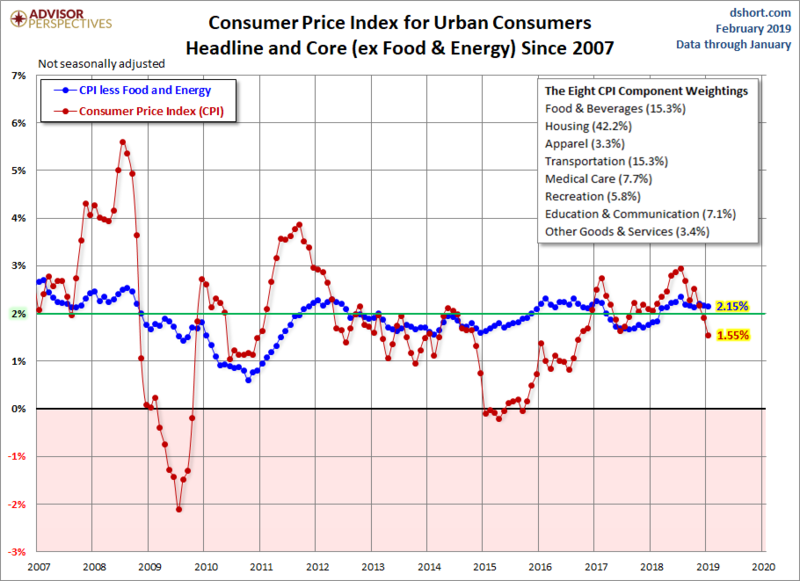 The chart below shows Headline and Core CPI for urban consumers since 2007. Core CPI excludes the two most volatile components: food and energy. We've highlighted the 2% level that the Federal Reserve is targeting for inflation, although the Fed traditionally uses the Personal Consumption Expenditure (PCE) price index as their preferred inflation gauge. Year-over-year Core CPI (the blue line) was above 2% from the end of 2015 through February 2017 and is now above that benchmark as of March 2018. The more volatile Headline CPI has spent about half of the last five years under the 2% lower benchmark, and much of the volatility in this metric has been the result of broad swings in gasoline prices (more on gasoline here). 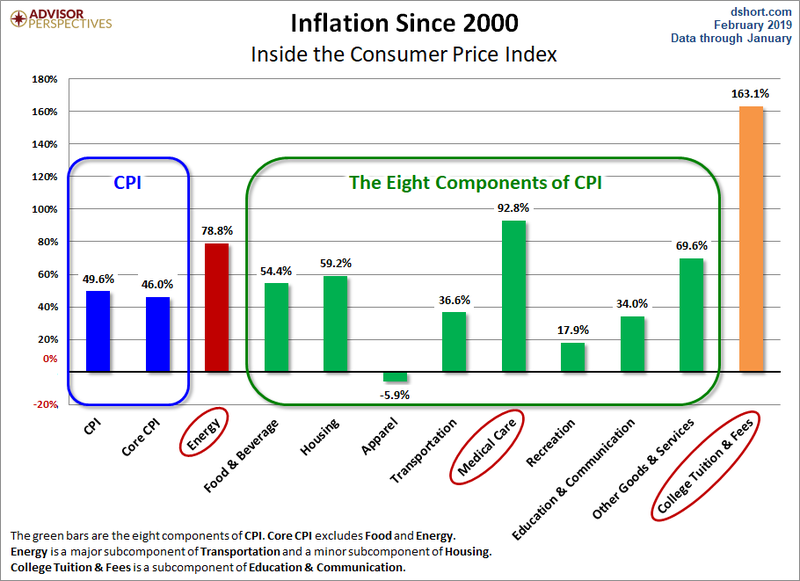 For a longer-term perspective, here is a column-style breakdown of the inflation categories showing the change since 2000. Note: For additional information on the component composition of the Consumer Price Index, see our Inside the Consumer Price Index.